Frankly Anouk: The Perfect Red Lip? A bold lip can really brighten your complexion. My preference is a dark and matte red lip, especially during the colder months. My winning combination? 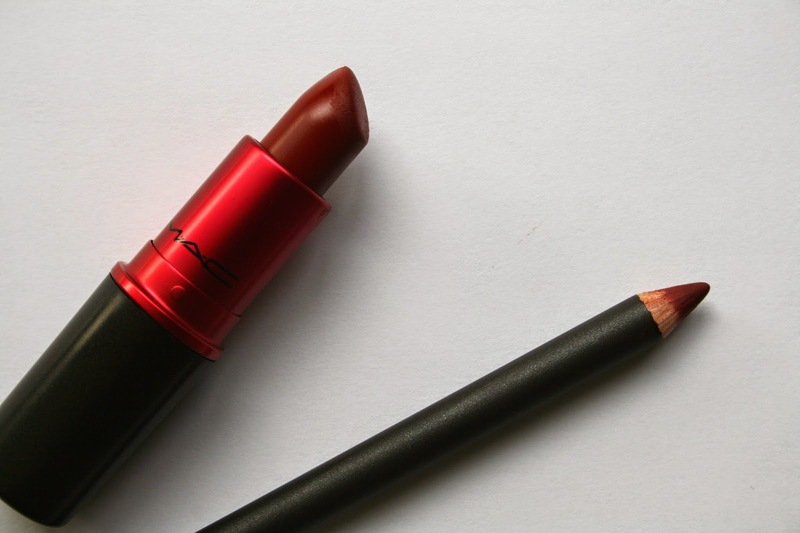 MAC's Viva Glam I lipstick (€ 20.00) and Burgundy lip pencil (€ 15.00). Viva Glam I is a true red on the lips, while Burgundy is more wine red. On their own, I find Viva Glam I a bit 'red' and Burgundy a bit flat looking. However, together they are the most perfect red. The undertones in both colours make your teeth appear more white, and their formulas make for a whole evening of not worrying about your lipstick. Although they are matte, I don't find them uncomfortable or too drying. (I do wear a bit of lip balm underneath, just to be sure).